Cultivation of purple sweet potato is the right choice for farming because it is quite easy to maintain and does not depend on the season in planting. In addition, the business opportunity of purple sweet potato cultivation is still a great opportunity because of the increasing need for food from tubers, especially purple tubers to be produced into various kinds of processed foodstuffs. The need for costs for the care of sweet potato plants is far less and produces a profit / profit that is much higher than fruit and other crops such as sugar cane, rice and soybeans. Sweet potato plants are very resistant to dry conditions (types of xerophytic plants) in the dry season and can remain alive without being watered for a long time. Even so, good care will be conveyed in the discussion of good and true sweet potato cultivation to produce large and abundant sweet potatoes. Sweet potato plants are popular vines that are cultivated by the Indonesian people to use the sweet potato as a complementary dish and young leaves are used to make vegetables. Sweet potatoes are also widely used as ingredients to make snacks such as cakes, typical souvenirs of chips, bakpia and bakpia, chewing drinks and even ice cream. In certain areas, sweet potatoes are one of the staple food commodities. Sweet potatoes are one of the food ingredients with abundant carbohydrates that the body needs. We can make sweet potatoes as an alternative staple food instead of white rice. Actually the nutritional content of sweet potatoes is better when compared to white rice rice. Sweet potato plants commonly called yams have the scientific language Ipomoea Batatas L. It is a food from South America that lives in tropical temperatures. 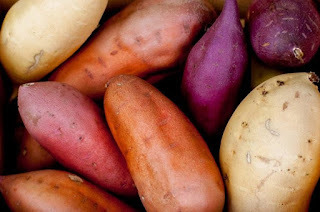 There are many types of sweet potatoes that are cultivated in Indonesia, seeing from the colors that are popularly planted are brownish white, red, and purple sweet potatoes. Some types of sweet potatoes that are popular include prambanan, borobudur, mendut, kalasan, ibaraki, cilembu, lampeneng and georgia. In Indonesia, sweet potato cultivation achieves the most optimal productivity when planted in the lowlands to an altitude of 500 meters above sea level (masl). However, this sweet potato plant can still grow well at altitudes above 1000 masl, only the length of time for harvesting from planting time to be longer. Sunlight is needed by this plant for maximum results, the need for sunshine is around 11-12 hours a day. Sweet potato cultivation is suitable in tropical regions with humid and hot temperatures. The ideal temperature for plants for sweet potatoes is 21-27 degrees Celsius with rainfall of 750-1500 mm per year. Purple sweet potato is the author's favorite because purple sweet potatoes in the content of benefits and nutrition are higher than white sweet potatoes. In 100 grams of purple sweet potato contains about 7,700 mg of vitamin A, defeating the content of vitamin A in tomatoes. Other purple sweet potato contents include crude fiber, vitamin C, B1, lysine, Zn, K, Mg, Cu, minerals, fats, proteins and also include high carbohydrate sources. Fiber content in purple sweet potatoes is very good for digestion, very suitable for diet programs. In addition there are antioxidants and which function for immunity and endurance and are effective in preventing cancer. Starting a Purple Sweet Potato Cultivation, Here's the Complete Guide! I can say how to cultivate sweet potatoes for all types is all the same technique, the difference is the speed of harvesting from the planting period. There are 4 important steps that you should consider for good and true sweet potato cultivation. These four methods are quite simple and must be a concern because they will have an impact on the harvest you get. You can buy good and superior seeds from the place where you can buy superior quality sweet potato seeds. The seeds themselves have many varieties, especially from the shape, you can get the purple sweet potato seed of the superior variety in the shop that sells agricultural seeds that have gained the trust of the agricultural service. To prepare seeds in the cultivation of sweet potatoes can be done in 2 ways, namely generative methods and vegetative methods. Generative nurseries are rarely done, but for the results obtained are much better and healthier for prospective sweet potato plants. Preparation of seedlings in a generative way, namely seeding from the tubing of the tuber and producing new shoots. If you choose a generative method, how to choose good quality and healthy tubers, the tubers are then sliced ​​into 2 or more parts (the function is to stimulate the tubers to grow roots and new shoots quickly). Bulbs that have been sliced ​​are stabbed with bamboo which has been sliced ​​as skating or gaping. Then half of the bulbs will be placed in water, half above the surface to grow new shoots. Set it so that the half-bulb stays in the water and the other half is exposed to sunlight. Prepare a container filled with water, the container can be like a glass of mineral water / tub to put a lot of tubers that have been fastened. Place a container that already contains tubers in a damp, shady place (stay in sufficient sunlight) until the shoots come out until 2-4 weeks until the roots appear a little. After the shoots grow and appear small roots, the buds are moved separately to a special place such as a small polybag / bowl, flush every day with enough water for 2-3 days until the buds look fresh and the roots grow more. The last process, the fresh shoots have become superior seeds that are ready to be planted in your garden / land to grow. Vegetative nurseries are nurseries without fertilization from tubers. This nursery is done by cuttings from the selected sweet potato root stems to be used as broodstock. How to choose a good broodstock is a plant that is aged over 2 months with a short and large stem segment (can the stem can shoot from the stem). You cut the stem with a length of about 20-25 cm, with each piece having at least two segments. In the first segment to grow roots faster and the second segment to grow new shoots. Do the pemotorngan stem for seedlings in the morning. For the treatment of seedlings vegetative way, the stem that has been cut is cut off and discarded the remaining leaves are stretched to the stem to reduce excessive evaporation, then collect the selected stems and tie with a rope (can raffia) per 100 stems / cuttings, keep in a place shade and cool in a standing position (not to be stacked) for 7 days. After that, the seeds are ready to be planted in your land. Usually this vegetative method is widely used because the seed preparation process is relatively faster if used on large land. For one hectare of land, around 36,000 sweet potato seeds are ready to be planted. Note, nursery by cuttings can be done for generations, about 3-4 times the setting. If the nursery has arrived 4 times starting from the new breeders in a generative way / fertilization of the direct tuber. Because the more the breeders do from the cuttings, the quality of the plants and the tubers results in worse, smaller and even fruitless. This land preparation must be carried out within a minimum period of 3 weeks before planting the seedlings. A good soil condition for sweet potato cultivation is sandy clay soil, loose and contains lots of nutrients and has good drainage. The ideal soil for sweet potato cultivation requires a degree of soil acidity of around 5.5-7.5 pH. Cultivation of sweet potatoes in dry and cracked soil will reduce plant immunity, as a result the plant is susceptible to pests and diseases. Conversely, if it is planted in a muddy or wet place the result of the tuber will be stunted, high fiber content, easily decayed tubers and lump shape. Sweet potato plants grow well on dry fields or former rice fields. On dry fields, sweet potato cultivation is suitable at the end of the rainy season. While for paddy fields is more suitable in the dry season. To prepare good land, the need for fertilizer to improve soil quality requires a lot of fertilizer, especially the former rice fields. The first thing to do is to plow the soil by hijacking (with a tractor / plow machine), the plowed soil will try to be loose and smooth and then make soil beds / mounds for later sweet potato planting media. Every single row of beds has a width of about 80-100 cm. When hijacking, you add organic fertilizers such as animal waste and old leaves that have become compost. For the selection of organic fertilizers from good feces are cow dung, goat manure and chicken manure provided that the feces have been fragmented / dried first. Provision of manure for tillage on an area of ​​one hectare of doses needed about 20 tons of manure. Selection of organic fertilizer is better because it is more natural and healthier if you consume plants from organic cultivation. Organic fertilizer from manure contains many good elements for plants such as nitrogen (N), phosphorus, potassium (K), calcium (Ca) and others. Another advantage is that organic fertilizers such as dirt are more environmentally friendly and do not damage the soil. All organic fertilizers that have been composted and fragmented are mixed together when the soil is blended to be mixed and reprocessed by the soil on the land. When you have finished preparing the land and the mounds of land are ready, you need to pay attention not to planting sweet potato seeds directly. The process of waiting until the soil is ready to be planted at least 3 weeks after processing the land, if it is too soon the soil is still processing the fertilizer that you prepared earlier. If in this process the process of growing plants becomes even less optimal and even many die / wither. Plant between weeks 3-4, if it is too long it is also not good because nitrogen in the soil will be much reduced, the element of nitrogen (N) soil functions for the fertility of plant seeds so that they grow faster for shoots, roots, stems and leaf foliage and bulbs for thick fruit. During the waiting period until the land is ready to be planted with seeds that have been prepared, the land maintenance is by irrigating or moistening enough water, the water should not reach the agricultural land. Sweet potato growers are quite easy to do, but there are trivial things you should pay attention to for this planting so that sweet potatoes grow optimally with sufficient nutrients. Sweet potato seeds should be planted by immersing 2/3 of cuttings into the ground. On one row of planting land there are two rows of plant rows, seeds are planted on both sides slightly out of each bed. The distance between plants is one row 40 cm, this is so that the inter plant has a maximum portion of nutrients from soil nutrients. Seedling techniques are carried out in a smooth way, first from the ground the beds are dug a little with a light planting tool, place the seeds on the perforated soil. Then fill the seedlings in a smooth way. After all the seeds have been planted, the next stage is watering. At the beginning of planting, try to keep the soil moist and wet, watering is done every morning and evening on each seed that has been planted on the beds. If the intensity of the rain in the area of ​​the crop is quite high, you do not need to water. If there is too much rainwater, you must reduce it so that the soil moisture content is maintained. Treatment of this initial planting is carried out routinely around 2-3 weeks and ensures the plants grow new stem shoots, let the wild buds grow to the ground to optimize the initial growth of the seeds you plant. After 3 weeks if there are seeds that die, fail to grow or wither, immediately do the replanting by replacing the seeds that failed to grow with new seeds. This refining activity while you take care of the soil and clean the weeds / weeds that grow on the beds provided for the sweet potato plant. Grass / weed cleansing is very important because it can interfere with the growth of your yams. Nutrients contained in the soil will be divided with weed plants that grow together with sweet potato plants. The procedure for removing weeds must reach the roots so they will not grow again. Weeds that grow large enough should be removed / removed from around the beds, but if the weeds still grow small about 0.5 cm can be pulled out, cut off the roots and sunk in the ground around the beds. Small weeds / grasses contain lots of nutrients and nitrogen which are good for plants that are growing. If you see a sick plant or a pest, usually the plant will look wilted and unhealthy marked with yellow leaves and many fall out. Pests that attack sweet potato plants are usually caterpillars that are in yams or on leaves. The solution is to clean the diseased plants so they are not contagious, that is indeed by chemical means by spraying insecticides such as Curacron 500 EC or Matador 25 with the recommended concentration. If you find a plant that is too bad, you have to pull it out to break the transmission to other plants. Irrigation during yam growth is also still needed to grow large and abundant plants and tubers. The period of formation and development of sweet potato fruit within 1-2 months after planting. At this time enough watering is done once a week, the best watering time is in the morning or evening. For irrigation, water irrigation must function properly, this is important to note in watering activities is to avoid the soil is not too muddy. Watering can be done once a week continuously. Then watering can be stopped at 2-3 weeks before harvest. At the age of 4 weeks after planting, treatment is carried out in the form of soil extinguishing by breaking it down little by little around the base of the planting of sweet potatoes, a distance of about 10 cm from the center of the plant roots. This is intended to grow plants not to spread everywhere, from the experience of farmers in this way, optimal growth results, neat and tubers that are produced quite large. At the age of 6-9 weeks the dismantled soil is closed again while smoothing the roots that spread out from the planting path. If the tuber growth concentration is set centrally at the base of the root, the bulbs will grow large. The period of sweet potato ready to be harvested is when the sweet potato plant is 3.5-4.5 months old, depending on the sweet potato variety planted. A good harvester is done during the dry season, harvesting when the soil is loose and too wet will make the sweet potatoes wet and susceptible to decay. If the harvest time coincides with the rainy season, the solution is to choose a day at least 7 days after the rain falls. If it is difficult to find a suitable day, after harvesting the harvested tubers must be dried from the remaining water, can be dried or dried so the tubers are drier. Make sure after harvesting the tub is clean and dry. Successful cultivation of sweet potato plants is a plant that can produce at least 1 kg of each plant seed. Calculations for one hectare of land can produce 25-30 tons. In certain varieties such as borobudur and kalasan sweet potatoes can reach 30-40 harvests per hectare.